THIRD-LEVEL STUDENTS are being given the chance to explore the parallels between two men who died relatively young, but whose lives had a big impact on Ireland. 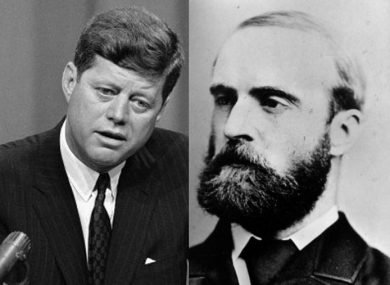 The Parnell Summer School in Wicklow is to discuss the parallels between Charles Stewart Parnell and John F Kennedy in their “Lost Leaders” themed week in August. There were many parallels in the two lives, most notably, the fact that both were young leaders who died prematurely – Parnell at 45, Kennedy at 46 – and so both have been mythologised as lost leaders. The study is timely considering the spotlight on JFK’s influence on the still relatively new Irish state during his visit here 50 years ago. This year, the school – which is happening at Parnell’s old estate at Avondale from 11 to 16 August – is offering scholarships for interested third-level students to attend the week. The package covers the attendance fees, shared accommodation and transport from the hotel to the school daily. If you are interested, write to Felix M Larkin at felixmlarkin@gmail.com outlining briefly why you would like to attend and enclose a reference from your tutor/supervisor/departmental head. Yesterday was the 117th anniversary of the birth of Charles Stewart Parnell, whose grandfather fought under (Commodore John) Barry and whose mother was born in America, and who, at the age of 34, was invited to address the American Congress on the cause of Irish freedom. ‘I have seen since I have been in this country,’ he said, ‘so many tokens of the good wishes of the American people towards Ireland.’ And today, 83 years later, I can say to you that I have seen in this country so many tokens of good wishes of the Irish people towards America. Some of the topics to be considered at the summer school include public service in its essential form (‘Ask not what your country can do for you; ask what you can do for your country’) and the public attitude to the private “moralities” of Irish and Irish-American leaders (both Parnell and JFK’s personal lives have preoccupied the public imagination). For the full schedule of talks, panels and speakers – which includes politicians, historians, media heads and diplomats – at the Parnell Society website. Email “Parnell and JFK: Parallels up for discussion”. Feedback on “Parnell and JFK: Parallels up for discussion”.